great under counter wine coolers. Read our reviews, chill to perfection, bottoms up! Design- The aesthetic of an under counter wine cooler can say just as much as the bottles it holds. Is the wine fridge big and flashy or classic and full of character? Does it feature contemporary design, or is it designed to appear more rustic and well worn? Size- What are the actual dimensions of the space? And how much does it weigh? Is this something I can install myself or will I need help? Function- What role do you need your under counter wine cooler to fill? Will you need to find one that can keep two separate temperatures for your white and red bottles? Do you want this to function as a beverage center or is it dedicated to wine? Temperature Range- Is this wine fridge a single or dual zone? How high or low can it go? Size - 26” H x 17” W x 19” D – 45 lbs. The Wine Enthusiast Evolution Series Beverage Center may seem out of place on this list, but in reality it will fit right in. Providing a cooling area for easy access for wine, beer, sodas, and juice, this Wine Enthusiast product will install comfortably into any counter under space. Featuring a temperature range between 34 degrees and 43 degrees Fahrenheit, this beverage center features a simple, contemporary stainless steel design that won’t look out of place in your kitchen for a lower price than a dedicated wine cooler. Just be careful how low you set your thermostat. With a low end near freezing, the wine cooler could build up ice with proper moisture inside, and the unit can run loud when compared to other coolers. Still, if you are looking for a under counter beverage center that can fill the role of a wine cooler, while still handling other items at a very reasonable price, you arguably won’t find a better deal for something of this size and quality for a similar price. 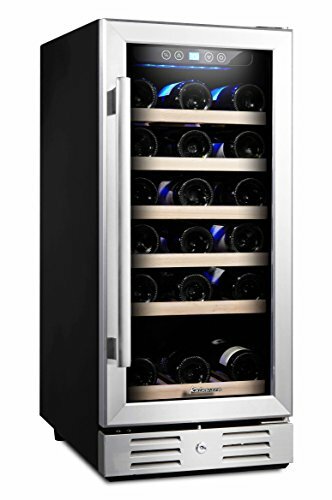 For its mix of stainless steel, cooler temperatures, and the very low price point comparatively speaking, I view the Wine Enthusiast Evolution Series Beverage Center as a fantastic bargain, and rate it an 8 out of 10. Size - 35” H x 15” W x 23” D - 84 lbs. The Whynter Dual Zone Wine Fridge is a great gateway into the world of quality wine storage. Built for the wine connoisseur who has a variety of bottles to keep at different temperatures, this dual zone under counter wine cooler features two separate cooling areas with a range of between 41 degrees and 50 degrees Fahrenheit for colder varietals, and 50 degrees to 72 degrees Fahrenheit for a customizable cellar temperature for your whites or reds. The Whynter features stainless steel trim and a tempered double pane gray smoked glass for UV protection, and include an open door and malfunction warning system to warn you should your wine stock be jeopardized. Also features are a lock and key for the door, and LED lights to showcase a collection of up to 28 wine bottles. The Whynter has a small criticism, however. Some complain about the unit’s longevity and claim the units will only last 1 or 2 years before having trouble. This group is certainly in the minority, with the Whynter receiving nearly universal love on Amazon. Still, to be safe, I would consider purchasing the extended warranty plans when considering this product. The Whynter Dual Zone Wine Fridge is one of the lowest priced dual zone wine coolers, representing a great mix of attractive features, customizable temperature control, and security. For these reasons, I see the Whynter Under Counter Wine Fridge as an 8 out of 10. Size - 35” H x 24” W x 25” D 154 lbs. 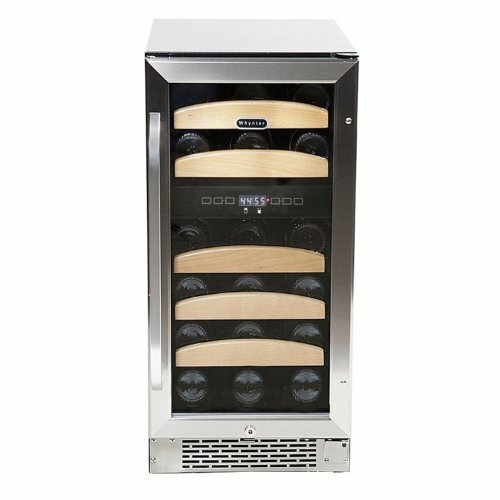 The Vinotemp Wine Cooler is a heavy duty under counter wine cooler built to house a larger assortment of wine in a small space. 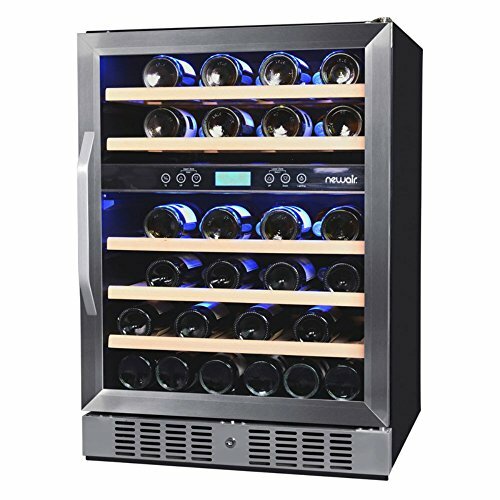 Pushbutton LED temperature controls allow you to keep up to 50 bottles of wine at a temperature of your choosing between 45 degrees and 65 degrees Fahrenheit. Stainless Steel and wood trim make for a presentable, controlled cooler that is easily accessed via a thermal paned glass door, and is illuminated via soft LED lights with the touch of a switch. Vinotemp is well known for making a solid product that will last for years, and this wine cooler is not exception. It is ideal for storing a large assortment of wine and can be easily built into the underneath of any existing counter space. But if there is one drawback to Vinotemp, it is arguably its customer service. Occasional issues will crop up with any wine cooler, and while Vinotemp is a great product, they are not immune to this. Replacement parts are charged at a premium price, and there have been issues reported through the years about subpar customer service, or a lack of customer service available in certain areas. These reports are very limited, and Vinotemp does actively work with you to help in the event that an issue does come up at some point, minimizing the rumor as it were. Overall, the Vinotemp Wine Cooler is a high capacity, reliable wine cooler built perfectly to fit under your counter space. For its combination of price, capacity, and quality, I rate the Vinotemp an 8 out of 10. Size - 34” H x 15” W x 23” D - 73 lbs. The Kalamera Under Counter Wine Fridge is a best seller on Amazon. Featuring a 30-bottle capacity, the Kalamera has a stainless steel frame and double layered tempered glass door that provides access as well as additional insulation. This under counter wine fridge uses advance compressor technology for even air circulation and low vibration, and is controlled using a LED display for pinpoint control, with a temperature range of 40 degrees Fahrenheit to 66 degrees Fahrenheit. The Kalamera is a handsome, slender piece with a minimal footprint that will install easily underneath most countertops, with enough metal and wood to match most kitchen appliances. 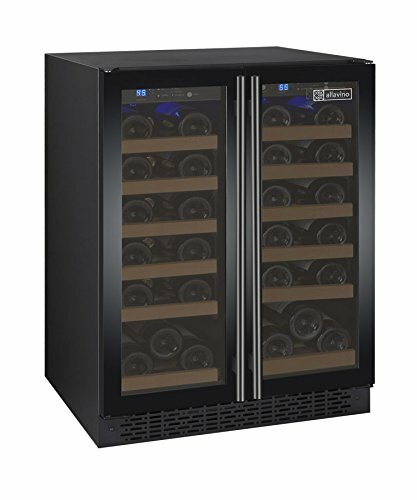 The Kalamera is priced in line with most dedicated under counter wine coolers, with the only drawback being the occasional issue with damage during shipping at the already high price point of wine coolers as a whole. If you do not need to keep your wine selection at different temperatures, this is a great value purchase. For its mix of quality, storage capacity and craftsmanship, mixed with its reasonable price point, I rate the Kalamera Under Counter Wine Fridge an 8.5 out of 10. Size - 32” H x 22” W x 24” D – 104 lbs. 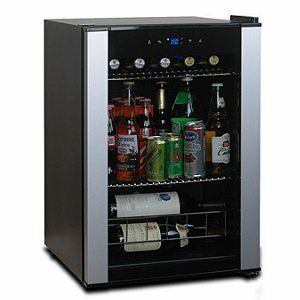 The NewAir Dual Zone Wine Cooler is a great mix of dual zone control and storage capacity. Finished in stainless steel with woodnotes, the NewAir can hold up to 46 bottles of wine across 5 separate drawers. Dual Zone LED controls give the owner the option to keep bottles both high and low at different temperatures between 40 degrees and 66 degrees Fahrenheit. This mix of capacity and dual zone control does come at a cost, with the NewAir listing considerably higher than the Whynter product. Still, it is an excellent mix of everything the more serious wine enthusiast would want in his or her under counter wine cooler, and I rate the New Air Dual Zone Wine Cooler a 9 out of 10. Size - 33” H x 24” W x 23” D – 141 lbs. The Allavino FlexCount Dual Zone Wine Cooler is probably my favorite wine cooler out there today. Featuring Dual Zone digital technology, the Allavino can keep two separate compartments at separate temperatures ranging between 40 degrees and 65 degrees Fahrenheit. This is an energy efficient unity that uses up to 25% less energy while being very quiet, and offers space for up to 36 bottles. The Allavino features a black finish with wooden trays, and a beautiful French door design for easy access to your collection. Even the shelves have extra design features, rolling on ball bearings instead of a standard tray system, and temperature is controlled using an LED display for a smooth overall interface. It’s actually hard to find negatives with the Allavino, with the few out there based on personal preferences like “slightly more loud” or “slightly more expensive” than other units purchasers have owned. And to be fair, this price is higher for a 36 bottle cooler, just not overly so. 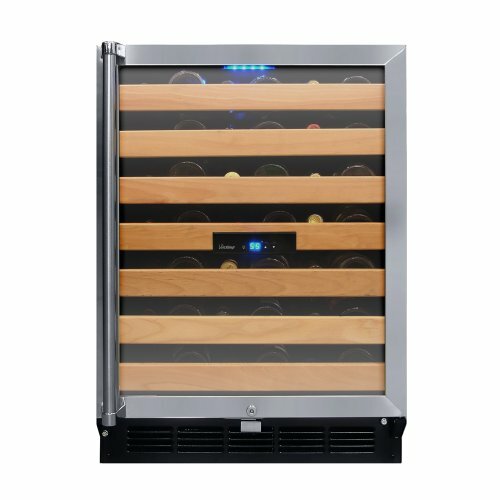 I see the Allavino as an excellent value, mixing dual zone control, ample space, and handsome design features together into a successful under counter wine cooler that will let you keep your wine collection safe. I rate the Allavino FlexCount Dual Zone Wine Cooler a 9.5 out of 10, and definitely suggest that you consider this purchase. There are many things that go into the creation of a bottle of wine- the vineyard’s type of soil and weather, the oak barrels used in fermentation, the temperature and humidity from ground to grape to glass, and the heavily controlled environment through this process all have a large and measurable impact on the final product. The care and expertise that goes into creating wine is not taken lightly, and years upon years of expertise, care, and thoughtful work go into every bottle that has ever been opened- be it one of the finest bottles ever grown on the Rhone or the cheapest bottle ever made in Long Island. The production of wine is something undertaken in virtually every corner of the globe, with a rich heritage spans thousands of years, and countless lessons learned in that time. Even the most modestly priced wine bottle has been shaped in some way by each lesson before it. If you’re like me, you probably have a mix of bottles- standard favorites in red or white that you keep on hand, with a few nicer bottles that are 5 or 10 years old.